The Great Stone Face Children's Book Award is voted on yearly by New Hampshire's 4th through 6th graders. The winner for 2011, announced recently, is Murder at Midnight by Avi [J MYS AVI]. We have ordered all the latest titles, so if they're not in our collection, they should be available shortly. The Library is closed today for the Memorial Day holiday. Here is a poem from Our Holidays in Poetry, edited by Mildred P. Harrington [808.81 HAR]. It is called "Decoration Day," which is the original name of the holiday. 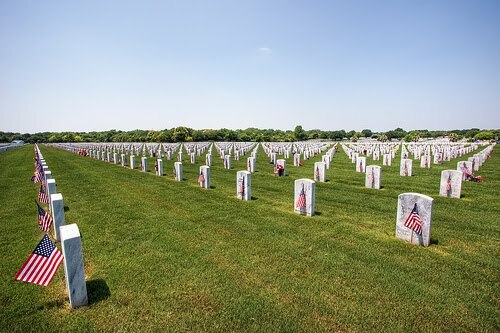 It was a day when people went to cemeteries to decorate the graves of the fallen. In the children's room we have an oldie but goodie, The Star in the Pail by David McCord, illustrated by Marc Simont [J MCC]. The text was originally copyrighted in 1925. This edition, illustrated by Simont, is copyrighted 1974. One of the poems in it is appropriate for this time of year, since, depending upon where you are, fireflies are beginning to show themselves. They're not here yet in New Hampshire, but will be soon. The starlight doesn't count for much. Just high enough--but not too high. I can't wait to see fireflies--they always make summer nights seem magical. 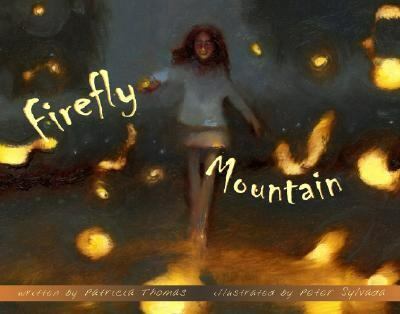 A friend of mine, Pat Thomas, has written a picture book about this magic, Firefly Mountain (illustrations by Peter Sylvada) [JP THO]. If you haven't come across it, rush right down to the library to get it! the heat squiggled up in waves from the meadow. To see more of Nathan Sawaya's art, visit his website. For a delightful story about a library lion, look for Library Lion by Michelle Knudsen [JP KNU] on your next visit. Publisher's description: Miss Merriweather, the head librarian, is very particular about rules in the library. No running allowed. And you must be quiet. But when a lion comes to the library one day, no one is sure what to do. There aren't any rules about lions in the library. And, as it turns out, this lion seems very well suited to library visiting. His big feet are quiet on the library floor. He makes a comfy backrest for the children at story hour. And he never roars in the library, at least not anymore. But when something terrible happens, the lion quickly comes to the rescue in the only way he knows how. Michelle Knudsen's disarming story, illustrated by the matchless Kevin Hawkes in an expressive timeless style, will win over even the most ardent of rule keepers. 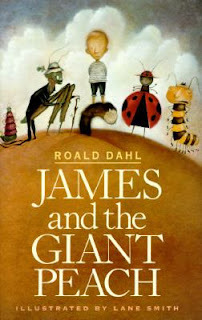 This year marks the 50th anniversary of Roald Dahl's James and the Giant Peach [J DAH, also J AB/CD DAH]. It was published way back in 1961 and has become a children's classic despite being somewhat controversial. For the decade, 1990 to 2000, it was number 56 on the American Library Association's "100 Most Frequently Challenged Books." It was made into an animated film back in 1996 [J DVD JAM]. Our copy has been out more than 100 times, so I guess we can say the movie version is pretty popular, too! Since this is a milestone year, the folks at the official Roald Dahl website have set up a "Follow that Peach" project where kids send a paper peach through the mail to friends. It is hoped that each peach reaches 50 people! For more information, click here. Today is Bob Dylan's 70th birthday. 70 years old! Imagine that! Have a rockin' birthday, Bob! When my kids were younger, every weekday afternoon they would watch the teen sitcom, Saved by the Bell. This went on for years and there were some episodes I heard so often while I was in the kitchen getting dinner ready that to this day I could probably recite the dialog! One of the characters was Jessie Spano portrayed by actress Elizabeth Berkley. After Saved by the Bell ended in 1993, Berkley continued with her career as an actress, but she was often approached by young women who had questions about their lives that they hoped that Berkley could answer. As a result, Berkley wrote Ask Elizabeth: Real Answers to Everything You Secretly Wanted to Ask About Love, Friends, Your Body--and Life in General [YA 646.7 BER]. Read an recent interview with Berkley here. 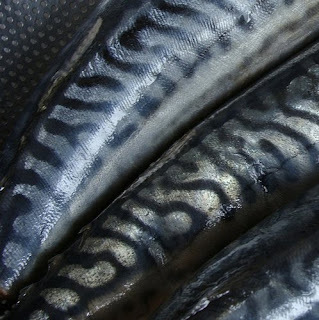 Poetry Friday--"A Display of Mackerel"
Last Saturday I was privileged to see poets Mark Doty and Patricia Smith read at the Mass Poetry Festival that was held in Salem, MA. Both Doty and Smith are skilled readers. I was particularly pleased when Doty read "House of Beauty." It is a favorite, and I wrote about it back in January 2009 after Doty won the National Book Award for his book Fire to Fire [811.54 DOT]. Doty read several poems from that book on Saturday. One that was particularly musical is "A Display of Mackerel." Doty told us the inspiration for it came at the Stop & Shop fish department in Orleans, MA! See, everyday life IS the stuff of poetry! Swim on over to The Drift Record where Julie is hosting the Poetry Friday Round-Up this week. A new Children's Poet Laureate was announced last week. J. Patrick Lewis is the newest (U.S.) Children's Poet Laureate, replacing Mary Ann Hoberman who served for the past two years. You can read an interview with Lewis, "A Circus for the Brain," at the The Poetry Foundation. Lewis has authored many books--we have 15 in our collection! One of my favorites is Doodle Dandies: Poems That Take Shape [J 811 LEW]. If your kids are into riddles, try one of Lewis's many riddle poem books, the latest being Spot the Plot: A Riddle Book of Book Riddles [J 811.54 LEW]. You can find riddle poems on his website, too, click here. I'll bet you have some ewaste in your home. Most everyone has an old keyboard stashed away, or a spare cable, or a CPU. If you want to get rid of this stuff, you can do it free this coming weekend at the Mall of New Hampshire in Manchester. The 6th Annual eWaste Event is sponsored by Small Dog Electronics. All of the ewaste collected will be processed in the US by WeRecycle. A small percentage of the ewaste can be salvaged intact, though elements such as tin, copper, silicon, beryllium, carbon, iron, aluminum will be broken down to be reused in other electronics. (Generally non-toxic materials such as plastic, steel and glass will also be recycled.) ALL electronic data is securely destroyed. 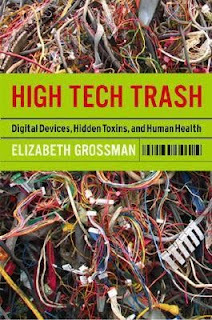 High Tech Trash by Elizabeth Grossman [363.7287 GRO] will open your eyes to the growing problem of ewaste--don't let the "stuff" in your home get out of hand! The New Hampshire Division of Historical Resources is celebrating "May is Preservation Month" by highlighting a unique New Hampshire historic property every day. Selections come from "New Hampshire’s Five Year Preservation Plan: Points of Interest and Touring Map," the 2011-2015 state historic preservation plan. We have so many beautiful historical areas in our state it's a shame not to be aware of them! The NHDHR blog says that funding is being sought to pay for printing copies of "New Hampshire's Five Year Preservation Plan." Copies will then be distributed to NH's public libraries--that's us! If you have a little spare change, think about supporting the project! When you tour some of the locations featured this month on the NH Preservation blog, you may want to bring along our copy of New Hampshire Architecture: An Illustrated Guide by Bryant F. Tolles, Jr. [720.9742 TOL]. You can read more about NH's preservation efforts in New Hampshire Preservation Alliance News, a quarterly periodical that we have in our magazine area [MAG NEW]. For information about Preservation Month nationally, click here. Pick up America's Historic Places: An Illustrated Guide to Our Country's Past [917.3 AME] for a nice overview of the vastness of our national historic heritage. Preservation--it's not just about canned peaches! Photo courtesy NH Division of Historical Resources. 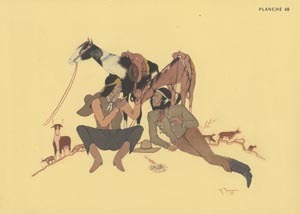 "Resting Cowboys," by Allan Houser (Apache), Plate 68, American Indian Painters, by O.B. Jacobson and Jeanne D’Ucel, 1950. Courtesy Tozzer Library, Harvard University. Harvard Square is a bit less than an hour's drive from Windham, but I'm sure most people don't think of it when planning an afternoon of museum going. You'll have a reason to plan a trip now that the Peabody Museum of Archaeology & Ethnology has opened up its latest exhibit, "Native Life in the Americas: Artists’ Views." ...many lesser known artists who portrayed Native American life and culture also deserve attention. This exhibition highlights some of their work by displaying selected prints and books from the Tozzer Library collection, looking beyond the familiar 19th century white male painters to include women artists, Native artists, and even one living artist.The exhibition also includes artists who were primarily illustrators, designers, and printmakers rather than painters. For more information about the Peabody Museum of Archaeology & Ethnology, you can view a video here. If you plan to visit the museum with your kids, you may want to borrow our DVD, Native American Heritage [J DVD 305.8 AME]. The video is part of the "American Cultures for Children" series. There's no need to hurry though--the exhibit will be on display until February 28, 2012. Poetry Friday--"Why I Am Not a Painter"
The greatest poems written in English over the past century, memorable masterpieces to read, reread, and enjoy. For each poet, a short biography is included. 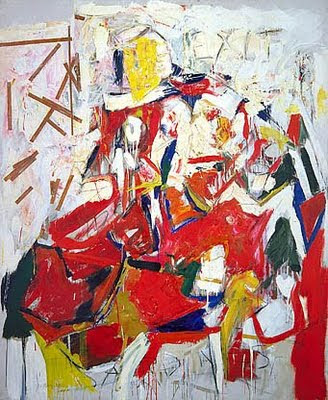 "Sardines" by Michael Goldberg courtesy Smithsonian American Art Museum. Included is "Why I Am Not a Painter," written by Frank O'Hara, who Parisi states, was at the center of the modern art scene in New York in the early 1950s. I hope you enjoy it. It tickles my funnybone, as does the painting above! The Round-Up this week is taking place at Jama Rattigan's Alphabet Soup. Jama always serves up a delightful treat--in more ways than one. Hey, You! Get on My Cloud! There has been a lot of questions lately about "cloud computing" now that a commercial by Cisco is being shown incessantly on TV, "This last year alone there's been a 67% spike in companies embracing the cloud." If you don't know what "the cloud" is, then your curiosity is piqued and you want to find out more. If you're a small business owner who doesn't know about clouds, you'll want to investigate further, so you won't be behind the curve. The library can help. 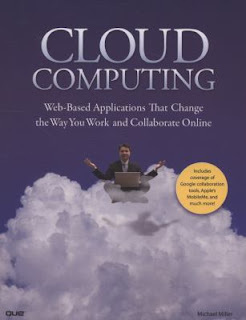 We have Cloud Computing: Web-Based Applications That Change the Way You Work and Collaborate Online by Michael Miller [004.76 MIL], and we have other titles on order. Here's my understanding of what cloud computing is: storing programs and data on a network of servers not belonging to the individual user/company. The stored data is accessible through the Internet, 24/7, from any location, and from any number of different devices such as a PC, netbook, iPad, Blackberry, etc. There are private, public, community, and hybrid clouds, which means that a few individuals, or many individuals, may access the information depending on the type of cloud. Some of the programs/applications that you may already know about are blogs (like this one), photo-sharing sites such as Flickr, Facebook, Twitter, wikis, etc. For more detailed information for business people, check out this report, "Cloud Computing: Fact versus Fog," December 2010, by Grail Research. At last week's NH Library Association conference, I attended a workshop titled, "Internet Safety and Youth Today." The speaker was an investigator from the NH Attorney General's office, and what she had to tell us was frightening, but important. Some of the issues she covered were cyberbullying (and teen suicide), chatting (don't believe it when someone tells you that chatting is passe), and location-based social networking. There are information sheets available on the Attorney General's website. Two that parents of teens should be aware of are Social Networking and Sexting. Also look at the AG's "Internet Safety Guides" available here. We have several books in our young adult section including Frequently Asked Questions about Online Romance by Ann Boger [YA 646.77 BOG]. Discusses online romance, providing information on the success of Internet dating, staying safe in cyberspace and offline, dangers to avoid, and how to proceed with a relationship. Includes a glossary and a list of resources. If you spend any time on Facebook, you've probably already seen this talking dog video, but, if you haven't seen it, it's not to be missed! My favorite "literary" talking dog is the star of a picture book series by Susan Meddaugh, which began with Martha Speaks [JP MED]. Martha, an otherwise ordinary mutt, learns to speak after eating alphabet soup! 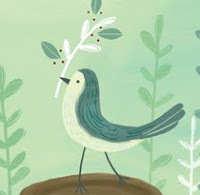 Martha has been animated for PBS and we have Martha Speaks in DVD format, too [J DVD MAR]. Since it is Children's Book Week, I thought I'd tell you about five of my favorite books of poetry for children, and the reasons why I like them. Masterfully simple, colorful shape poems that celebrate light. A neat package. This combination of prose and poetry truly captures the thoughts and feeling of a child. Thought provoking, highly visual, and fun! Edited by the late William J. Higginson, an expert on English language haiku, this is one of the few books of haiku for children that showcases poems not written in three lines of 5-7-5 syllables. The Poetry Friday Round-Up for this book celebratory week is being hosted by Terrie at Scrub-A-Dub-Tub. The Library is closed today, May 5, to allow all the staff to attend the NH Library Association conference that is being held in nearby Manchester. These conferences are a great opportunity for people to interact with peers, exchange ideas, and to learn how to better provide services to our users. Speakers include, from left to right: David Macaulay, Cynthia Lord, Brunonia Barry, Leslie Poston. And that's not even half of the offerings! We'll probably all come away with our brains nearly ready to explode! See you tomorrow. Worm attempts various jobs for his animal friends so that he can buy painting supplies and enter the art contest. Peter paints his best picture ever and although everyone agrees it is beautiful, only his parents know just what to do with it. When Grammy and Mama buy Jamaica Louise a paint set for her eighth birthday, they tell her to paint the world. She begins with the drab subway station where Grammy works, and makes Grammy and all the riders smile. Morris buys a set of paints as a birthday present for Benjamin, but he wants to keep them for himself. While a little girl who loves red--and loves to dilly-dally--stops to paint a picture on the way to visit her grandmother, her dog Rufus meets a wolf and leads him directly to Granny's house. Max wants to be an artist like Arthur, but his first attempt at using a paintbrush sends the two friends on a whirlwind trip through various media, with unexpected consequences. 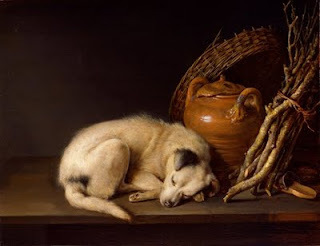 In the house alone, an unusual cat named Elemenopeo paints a picture and then curls up to dream. Poster by Peter Brown for CBW. 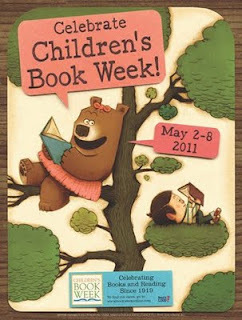 This is Children's Book Week! Books, and by extension, libraries, truly can change lives, so, let's all join in celebrating Children's Book Week by reading a kid's book, or reading one to a child. To get started, visit our children's room where we have everything from board books for babies, to classics like Little House in the Big Woods, to oversized Star Wars visual dictionaries. I know it is a cliche, but you really can find something for everyone at the library! To learn more about the van Otterloo collection, read this article from the New York Times, or visit the Peabody Essex Museum (PEM) website. To learn more about the van Otterloos and their "partnership," you can read an interview here. 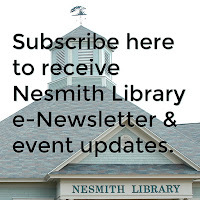 Reserve the library pass for the PEM, donated by the Friends of the Library of Windham, by visiting our website. And, before your visit borrow Dutch and Flemish Painting by Pierre Courthion [759.42 COU] from our collection of art books.